Does your website generate business? We can help. Let us maximize your web presence and drive revenue to your business. 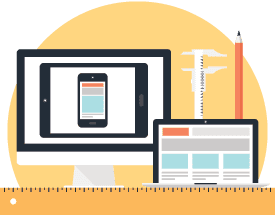 Our creative website design team will work with you to develop a clean, mobile friendly web presence with intuitive navigation and a pleasing layout that provides visitors to your website an effective delivery system for your marketing message and value proposition. With a over a decade of project experience, AgniTEK has an extensive website design and programming portfolio with literally 100’s of satisfied clients. We would be happy to review our portfolio with you at any time. If your company is in need of a new website look, custom software, or just a reliable web hosting platform, please contact us to view our portfolio and see what we can do for your business. AgniTEK made the site easy to navigate, easy to make changes on, and of course, it looks awesome. They were able to create our website perfectly, and we enjoy getting complements on how our site (www.fabfours.com) is one of the leading websites for our industry!